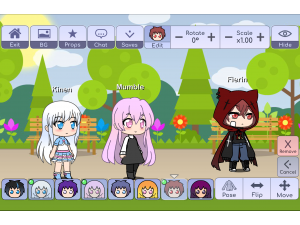 Studio mode is a feature in Gacha Life that enables you to create scenes using all the characters that you have occupying the first 8 slots. You can place any of these characters on the scene by tapping their icon which can be found at the bottom of the screen. You will be able to edit your scene in Studio mode any way you want until you are happy with the scenario you have created. Then all that needs to be done is to remove the interface by tapping the 'Hide' button at the top right corner of the screen. Once the interface has been removed you will be able to take a photo of the scene you just created. You can save up to 9 different scenes which can be reloaded and edited at any time.